Looking for something a bit different for your business trip or family vacation? The ibis Château-Thierry hotel gives you the chance to feel as though you're at the bow of a boat looking over our lake which combines relaxation and well-being. 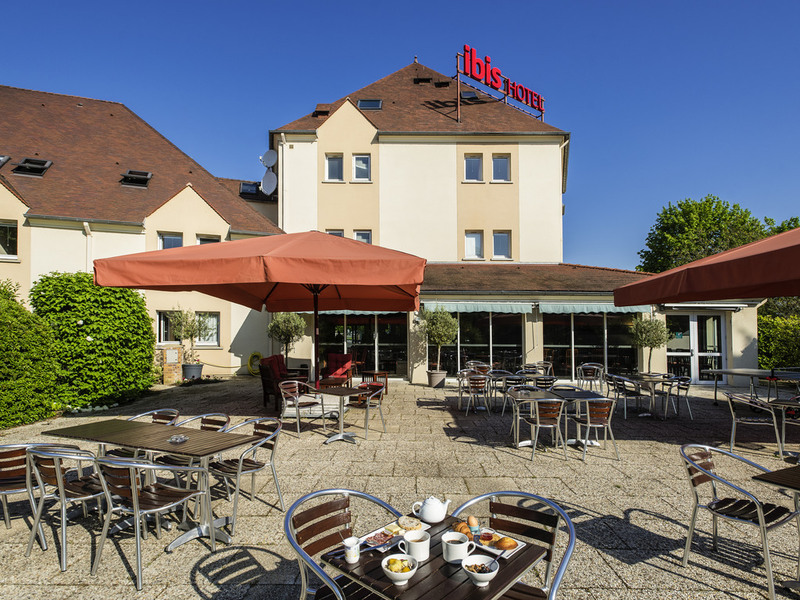 Your ibis hotel is ideally located a stone's throw from the town of Château-Thierry, a 7-minute drive from the SNCF train station and the town center, and 3.1 miles (5 km) from the A4 highway. 24-hour reception. With 55 rooms spread over two floors with e levator access, our hotel welcomes you for your business trips or vacations. Our hotel boasts two modular meeting rooms and a Lounge Bar where you can grab a bite to eat. Food lovers should try our buffet breakfast. In the heart of Champagne, a few minutes from the Pannier medieval caves, the abbey of Essômes sur Marne, Hotel Dieu, the Jean de la Fontaine museum, the Chateau Thierry American Memorial and the Viels-Maisons gardens. I have been visiting the IBIS at Chateau Thierry for 25 years. The staff are always very helpful and courteous. After a number of years the faces are familier and it is always good to see a friendly face after a long journey. The food is good, The Beds are comfortable and the facilities are good. What more could you ask for. As anticipated, a good 2 night stay. Charming hotel, clean, comfortable, handy for our journey, great breakfasts. Dear Guest L., Thank you for the great review of our hotel! We are glad that you enjoyed your stay and hope to see you again very soon. Sincerely, Mélanie, réceptionniste. Dear Guest C. Thank you for the great review of our hotel! We are glad that you enjoyed your stay and hope to see you again very soon. Sincerely, Mélanie, reception. Excellent accommodation for our mini adventure. Convenient, clean, good breakfast choices, easy check-in and out, could have done with hand towels too, not just bath towels. Will come again in September. Facilities good for a hotel of this calibration. it was a nice stay, breakfast buffet selection was good. However the lobby is rather small, it was crowded, and very loud and not enough seating in the front area. A great hotel for a one night stay. Easy to find coming off the motorway, great reception, very good room and an absolutely super breakfast. From check in to check out, staff were efficient and helpful. The morning breakfast buffet was varied and the madeleines in particular were VERY good. The lack of air conditioning in the rooms was problematic however as the weather was quite hot and humid. The ability of staff to quickly find a fan for our use made sleeping at night possible when I'm not sure it would have been afterward. There is considerable construction around the hotel at present and it began to get noisy shortly after 08:00. We arrived very late but were expected, room upgrade and overall very clean hotel. Breakfast if very good (for an Ibis). Very friendly staff. Nothing major to report, except that with most hotels the plumbing is rarely (never) visited by a professional. The drainage of the washing bowl namely was ever so slow. Matter notified to the receptionist at the time of our departure. Location was fabulous. We had a very pleasant stay. Shops restaurants and tourist attractions were all close by. Lovely little town too. Hello, we are very happy that you enjoyed your stay. Our hotel is situated in a relaxing setting near a pond, but also located not far from the sights. Do not hesitate to come back and see us on our next visit to Château Thierry. Sincerely, Adeline Sainte, Ibis Chateau Thierry. Good value near WWI memorial. We had a pleasant evening after tour the WWI battle area, cemetery and memorial.